What a very special way to spend a Monday! For the past two years, KZN Slots have been sponsoring these 10 little ones from the Amaoti community – to cover their educational needs as well as groceries, toiletries and other items they need each month. Falling under the banner of our HOPE projects for orphaned and vulnerable cases where our aim is to interact with the children, gear them up with uniforms, stationery etc for the new term as well as toiletries, blankets, groceries and other essentials. So many OVC cases out their and so many we work with and these 10 in particular have really touched our hearts as we’ve watched them grow over the past two years with the love and support of the KZN Slots team. 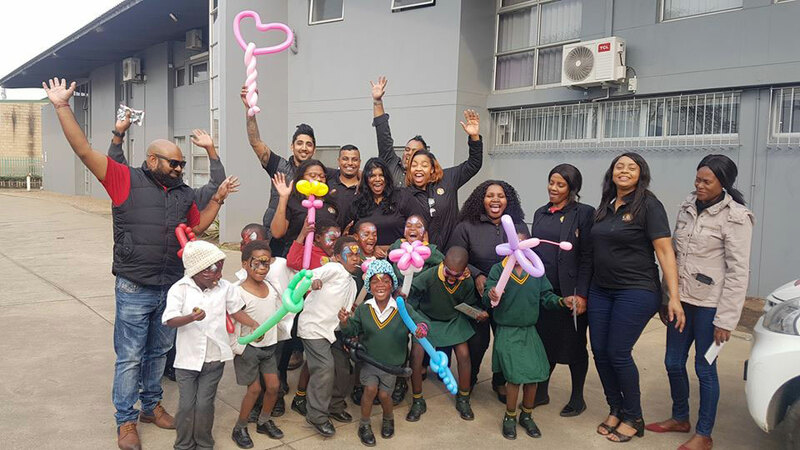 Every few months we get the children together with the KZN Slots team to see how they’ve grown, share some love and give them their new uniforms etc as well as some extra treats and their excitement today was just beautiful as they arrived the KZN Slots new offices with no idea where they wear but HUGE smiles and hugs and happiness when they saw our familiar faces waiting for them at the door and some extra special loves as we saw them off at the end of the afternoon <3 Thank you KZN Slots for your continued support with these children and the impact you are helping to make in their lives! And thank you to Innocent and Nozipho at Lungisani Indlela, our community liaisons, for your support in helping to arrange the children’s visits!